Description: The Dominion of Canada issued five dollar bills for the first time in 1912. Many collectors see these notes and think they are incomplete because they do not feature a portrait. Each note has a simple vignette of a train. The train is the Ocean Limited and it is traveling on the Intercolonial Railway through the Wentworth Valley in Nova Scotia. These bank notes are relatively available in all grades; but that does not mean they are always cheap. Varieties: There are eight different types of 1912 $5 bills based on the seal type, signature combination, and signature type. We are not going to get into the details here because none of the varieties are especially rare. Each bank note is already rare enough on its own. Please send us pictures of your bank note and we can tell you what type you have and advise as to its value. 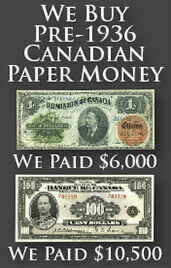 We buy all 1912 $5 bank notes from The Dominion of Canada. Values are based purely on condition and generally range from $300 to $3,000. If you would like our offer, then please send us pictures of your bank note. We will grade the paper money and respond back quickly with our buy and sell price. 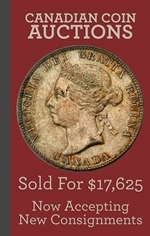 You might be surprised at how much money some high grade notes or rare varieties can be worth.